With LEGO Digital Designer software you will be able to create model designes with the help of LEGO bricks. Preview your designed model with the help of the camera controls. Use mouse controls to change the position of your bricks. LEGO Digital Designer for Mac OS X is provided as-is without any warranty of any kind. The entire risk arising out of use or performance of the software remains with you. 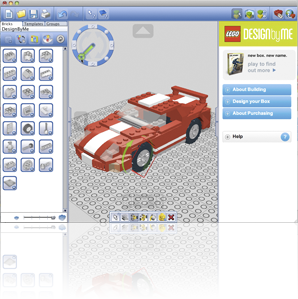 LEGO Digital Designer for Mac lets you build with LEGO bricks on your computer. ...... Preview your designed model with the help of the camera controls. Use mouse controls to change the position of your bricks. LEGO Digital Designer for Mac OS X is provided as-is without any warranty of any kind. The entire risk arising out of use or performance of the software remains with you. To the maximum extent permitted by applicable law, in no event shall the LEGO Group of Companies (including LEGO Systems A/S) and its suppliers and licensors, be liable for any damages arising out of the use or inability to use the software. To install and use LEGO Digital Designer for Mac, you must agree to the terms of the LEGO Digital Designer 3 License Agreement included with the software. Please be sure to read the License Agreement before installing LEGO Digital Designer 3 on your system. Build a runtime form designer with this component in just a few minutes. Qweas is providing links to LEGO Digital Designer for Mac OS X 4.1.8 as a courtesy, and makes no representations regarding LEGO Digital Designer for Mac OS X or any other applications or any information related thereto. Any questions, complaints or claims regarding this application LEGO Digital Designer for Mac OS X 4.1.8 must be directed to the appropriate software vendor. You may click the publisher link of LEGO Digital Designer for Mac OS X on the top of this page to get more details about the vendor.